When I first knew I was getting a divorce I told my then therapist, “I don’t know how to be an adult.” Even though I had done things like register to vote, buy a house, get married, have children, get a job, pay bills and taxes and all of those things that adults typically do, I honestly believed that I was no better off than when I was 17 and still living with my parents. Honestly, though, I had gone from living with my parents in the house I grew up in one day, to living with my husband the next. There were no in between s; no cool apartments with friends furnished with thrift shop furniture. No time to be on my own, no time to make my own mistakes, no time to live my life as I so chose. So after my divorce I did a lot of completely random things, in an attempt to “reinvent” myself into adulthood. For instance, I started wearing an excessive amount of makeup. I’ve never been big on makeup but for some reason I felt that getting divorced was reason enough to start wearing more. It was enough where my coworkers noticed and actually said something. Pictures of me during this time are interesting, to say the least. Then I started dressing different; wearing clothes that would look good on a 20 something but not on the 38-year-old mom that I was. I became obsessed with wedge sandals and 6 inch high heels. Once I bought a too short mini skirt and my mom (whom I was living with at the time) asked “are you really leaving the house in that?”As I walked out the door. Then I got into this phase where I would only buy something if it was purple. So I bought a smaller “non-mom” car, that wasn’t a mini van. The gas mileage was great. The space that it lacked for my 4 growing adolescents was not. 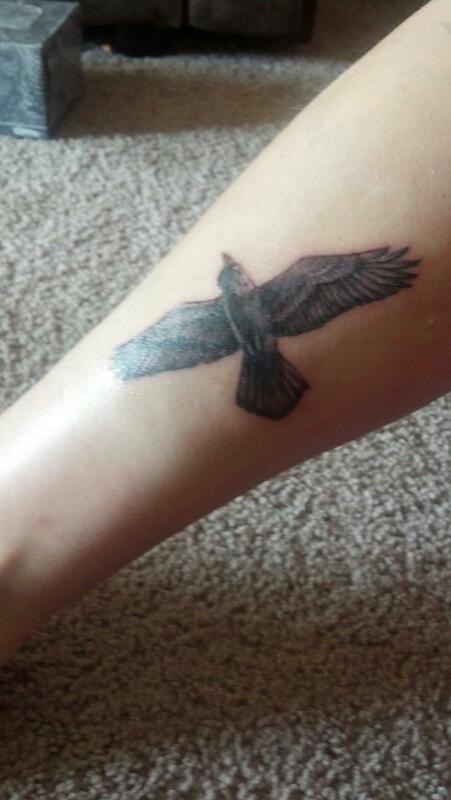 Then I got a tattoo. Of a blackbird. A female blackbird flying away, on her own. I feel like I”m doing okay. I’m not doing it perfectly, but that would make life boring. At least that’s what I let myself believe. It’s much better than believing I can’t do it at all. I’m flying with my own wings. I had to sell the “non-mom” car and buy another mini-van. I gave the mini skirt away. I ditched the heavy makeup look. I think I’ll keep the tattoo, though. I kind of like it.